Kraja consists of Linnea Nilsson, Eva Lestander, Lisa Lestander and Frida Johansson. 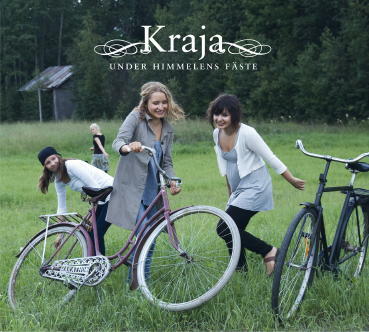 They are all from Umeå in the north of Sweden and formed the group in the spring of 2002 prior to the Umeå Folk Festival, where they made their debut. Typical for Kraja’s music are their unique four part harmony song arrangements and the repertoire comprises traditional Swedish folk songs, love songs, humorous songs, dance lilts and chorales, in addition to some material of their own. The word ‘Kraja’ is in the Sami language and means “the place you long for”. Following their cd debut with “Vackert Väder” in 2005 (DROCD 040), critics and audiences have warmly embraced Kraja and the group has enjoyed performing for audiences all over Sweden, and in Germany, Finland, Norway, Denmark, Ukraine and Estonia. This summer there will be a string of concerts both in Sweden and abroad, including Russia and Iceland. Work on a new album to follow Vackert Väder has been in progress since 2006, and this time Kraja has chosen to focus on some of Sweden’s most cherished folksongs. The new cd “Under himmelens fäste” (Under the sky) includes such well known favourites as Uti vår hage, En gång i min ungdom, En sjöman älskar havets våg, Jag vet en dejlig rosa and, of course, Allt under himmelens fäste.